THE VIEW FROM ROGER: After his first-round win at the US Open, Roger Federer candidly shared his perspective on the current game. On whether he is playing his best tennis now: “Yes. If I win the tournament here yes, maybe…I will take it match by match…I’m not thinking too far ahead, as I know some people are. I’m just happy that the last…one-and-a-half years I have been…very consistent. I’m playing the right way, and also in a way that’s fun for me. If I decide to have long rallies and stay back, I can do that. If I decide to move forward and step it up, I can do that, too. About his rivals, and how they’ve made him a better player: In the beginning it was Lleyton…who was a big challenge, and Andre Agassi…Those guys who dominated the baseline [were] difficult…It made me feel like a bad baseliner to an extent, until I realized I had to move better and be more consistent, have variation in my game. I started to figure it out bit by bit….Then the likes of Henman and Sampras explained to me how serve and volley was played…the art of sort of pressuring the opponent…Later, of course, this whole generation of Rafa, Novak, Andy – probably Rafa the most, [as a] lefty, challenged my backhand. I realized I had to return differently every single time I played against him. It made me a better player…And then that new generation – I would call it more new conditions, with the strings, the court surface slowed down – I had to adapt and become a physical player from the baseline with a lot of topspin and use the conditions from today to still be successful…With Novak it was always pretty straightforward. I didn’t feel like I had to adjust as much against him. He was just very good. And I saw the rise of Novak. I don’t know. [He’s] a difficult player to play against because he’s just that good. Next up for Bencic is a match against her very first pro opponent, Venus Williams, who holds a 3-0 record against the Swiss protege of Martina Hingis. 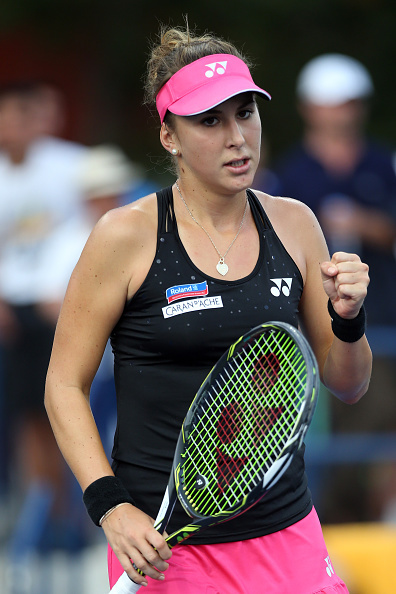 In fact, Bencic has yet to win more than four games in a set against Venus. KEYS TO FAME: Since Madison Keys reached the semifinals of this year’s Aussie Open, she’s become more of a household name. Following an easy second-round win in New York, the 20-year-old was asked about being recognized by fans. “I think the funniest [example] was in LA. A woman recognized me as she was driving and hit her brakes …and screamed out of her window…[She] was screaming my name and was like ‘I love you.’ I’m like, ‘Okay, don’t crash, bye,” she said, drawing laughter. CURIOUS KYRGIOS – NICK IN NEW YORK: It’s been said of Nick Kyrgios that his shot selection makes Gael Monfils look like a meticulous craftsman. People wonder where the new great players are coming from, but truth be told, we’re also checking the pipeline for the next great over-the-top characters. And many view Kyrgios as a new addition to the wild tradition of Pancho Gonzales, Nastase, Jimmy Connors, John McEnroe, Goran Ivanisevic and Marat Safin, to mention just a few. TOUGH TUESDAY: It was a rough day for racquets on the women’s side of the US Open – Kiki Bertens and Belinda Bencic hurled theirs on the way to losing and winning respectively, while Coco Vandeweghe smashed one in the first set of her second-round loss. END OF AN ERA: For the first time since 2004, the Bryan brothers are going without a men’s doubles Slam title this year – the 2014 US Open champs lost their title defense in the first round, falling to another American duo, Sam Querrey and Steve Johnson. YOUNG, OLDER: Donald Young overcame a two-set deficit to win his first-round match against Gilles Simon, “One-hundred percent I would have beaten myself up (in the past),” he told the New York Times.